Improve Your Handwriting is the only title to be written specifically for adults who are experiencing problems with their writing. Co-authored by a world-renowned expert on handwriting and a professional calligrapher, it uses self-diagnosis tests to help you identify your problem, before encouraging you to experiment and choose the style that suits you best. Covering everything from holding a pen, to the difficulties that left-handers face, and the problems that may be caused by medical conditions, you will be come away from the book armed with the ability to write with ease and confidence. One, five and ten-minute introductions to key principles to get you started. Lots of instant help with common problems and quick tips for success, based on the authors' many years of experience. Tests in the book and online to keep track of your progress. 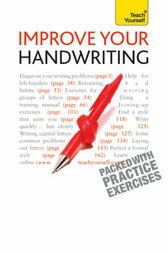 Extra online articles at www.teachyourself.com to give you a richer understanding of improving your handwriting. Quick refreshers to help you remember the key facts. Innovative exercises illustrate what you've learnt and how to use it.